On December 19, the exhibition dedicated to Federico Barocci\'s drawings has been inaugurated at the Department of Drawings and Prints. It will be open until 3 April 2016. The event is part of the Euploos project, carried out by the Cabinet of Prints and Drawings of the Uffizi, the Kunsthistorisches Institut Max Planck Institute and the Scuola Normale Superiore of Pisa. Thirty-eight drawings - mostly ordered according to thematic criteria - have been selected to show visitors working methods of Barocci, the great artist from Urbino. 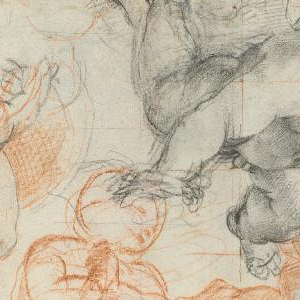 Drawings were chosen by Roberta Aliventi, a researcher who studies Barocci\'s work. Barocci used various and complex techniques, often making significant artistic experiments, such as the use of pastel. Some drawings are focused on the study and the composition of the figures, but also on individual details. Visitors can thus admire the creative path that leads from the first sketches to models very close to the final painting. It is thus revealed the tendency of Barocci in a continuous search for new solutions and experiments.